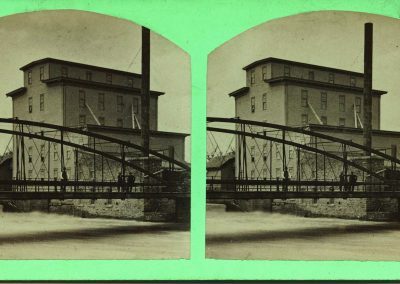 Town founder John North sold his flour and saw mills to Charles Wheaton, and in 1865, Wheaton sold the flour mill at the edge of Bridge Square to Captain Jesse Ames, a newcomer to Northfield. He purchased the flour mill with his sons John and Adelbert, saying, “It will be a worthwhile investment.” Indeed, the Ames family owned and operated one or more mills in Northfield for the next fifty years, and its members became prominent citizens. Jesse Ames was a founder of the First National Bank and served as its vice president. The railroad reached Northfield in 1865. That made it easier for surrounding communities to ship wheat to Northfield for processing and for flour to be shipped to market. The good oak in the woods surrounding Northfield was converted to flour barrels. The small flour mill could not keep up with the demand for its flour. So in 1869, Ames built a larger mill on the west side of the river, closer to the railroad tracks. This is the Ames Mill you see today. Captain Ames died in 1895. Adelbert sold the smaller mill on Bridge Square to the city in 1911, enabling it to start the improvement of the square. 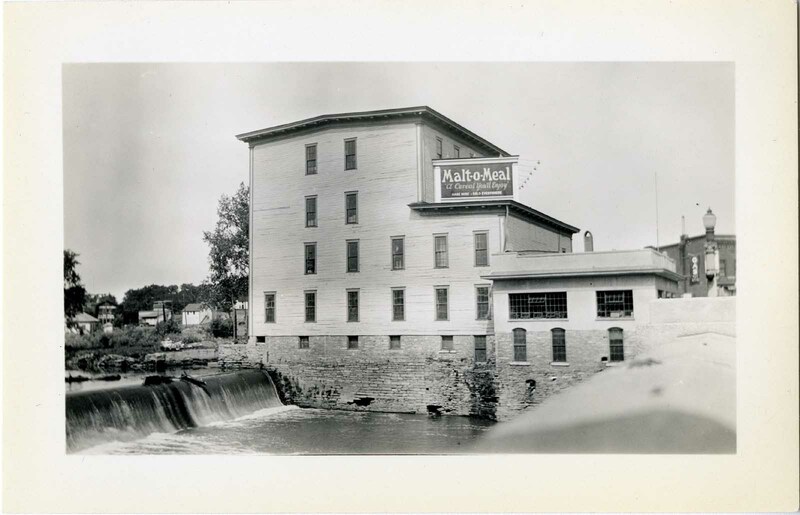 The larger mill on the river’s west side, the Ames Mill, was sold several times between 1917 and 1925, when the Campbell Cereal Company purchased it. In 1919, after John Campbell returned from World War I, he began experimenting with hot cereals made of wheat. His goal was to create a better-tasting cereal than Farina or Cream of Wheat that also cooked faster. A friend suggested that he flavor his cereal with malt, and Malt-O-Meal was born. 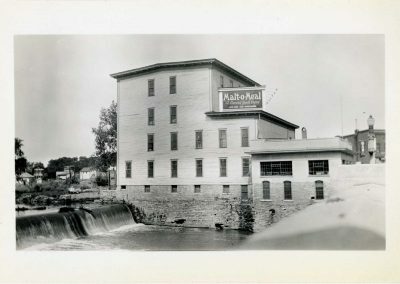 Production of Malt-O-Meal moved to the Ames Mill in 1927 when the Campbell mill in Owatonna burned. In 1961, Chocolate Malt-O-Meal was introduced. Later the company added discount, bagged cold cereals, which are manufactured in plants in Northfield; Tremonton, Utah; and Asheboro, North Carolina. The Malt-O-Meal company was purchased in early 2015 by Post. The Ames Mill in about 1885.